ASCO’s Policy Issue Briefs provide succinct overviews and relevant data on major policy issues impacting patients with cancer and the physicians who care for them. These briefs are designed to be especially helpful for journalists, offering background information on key issues across health policy today. Access ASCO’s full collection of Policy Issue Briefs. The National Institutes of Health (NIH) supports the overwhelming majority of federally funded medical research, and with the National Cancer Institute (NCI), has led to significant advances in cancer prevention, detection, diagnosis, treatment, and quality of life of patients. More than 15.5 million cancer survivors are alive in the United States today, due in no small measure to the nation’s commitment to cancer research. Examine strategies for improving the quality of life for patients with cancer and survivors. As cancer care demand and complexity has increased, federal research funding has failed to keep pace. 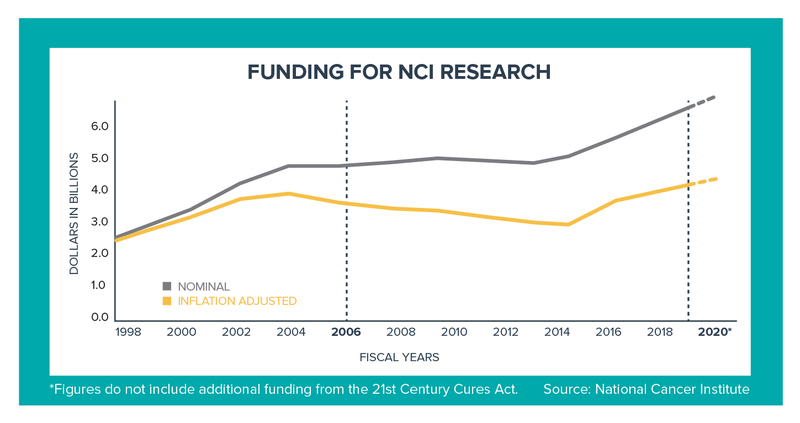 For much of the past decade, federal funding for medical research has been flat, limiting the ability of scientists to conduct research that advances the screening, prevention, diagnosis, and treatment of cancer. Research supported by the NCI helped establish that human papilloma virus (HPV) is a major cause of cervical cancer and helped develop the technology used to create the first HPV vaccines. The Pap test has helped reduce cervical cancer mortality by 60% since 1995. Lung cancer screening has reduced deaths from lung cancer among participants by 20%. The first anti-nausea drug cut vomiting episodes in patients undergoing chemotherapy by 70%. Highly effective treatments in many childhood cancers have resulted in increases in cure rates (from 10% to 80% since the 1950s). Breast-conserving surgery for breast cancer has enabled women to avoid disfiguring mastectomies. Tailored combination treatments have improved survival and reduced side effects for many common cancers. Research funded by NIH generates $69B in new economic activity across the country and supports 402,816 jobs nationwide (directly and indirectly). About 10% of the NIH's budget supports projects conducted by nearly 6,000 scientists in its own laboratories. ASCO’s publication on how U.S. investment in cancer research saves lives. ASCO's Cancer Progress Timeline of major advances in cancer research. ASCO in Action offers the latest news and information on this and other cancer policy topics. To schedule a media interview with an ASCO spokesperson or oncology expert, please contact mediateam@asco.org. National Cancer Institute. Milestones in Cancer Research and Discovery. https://www.cancer.gov/research/progress/250-years-milestones. National Institutes of Health. Cervical Cancer Fact Sheet. https://report.nih.gov/nihfactsheets/viewfactsheet.aspx?csid=76.. Powerful Anti-Nausea Drugs Alleviate Major Side Effect of Cancer Treatment, 1991; Dr. Patricia A. Ganz. O’Leary M, Krailo M, Anderson JR, Reaman GH. Progress in Childhood Cancer: 50 Years of Research Collaboration, A Report from the Children’s Oncology Group. Seminars in oncology. 2008;35(5):484-493. doi:10.1053/j.seminoncol.2008.07.008. National Institutes of Health. Budget. https://www.nih.gov/about-nih/what-we-do/budget.